How Smart is Your Enterprise Mobile Security? Wireless poses a persistent threat to corporations today and all devices (laptops, smart phones, tablets, etc) must be integrated within a consistent enterprise security policy framework. In addition, an enterprise mobility solution must continuously monitor all mobile devices and dynamically adapt their capabilities for every situation. 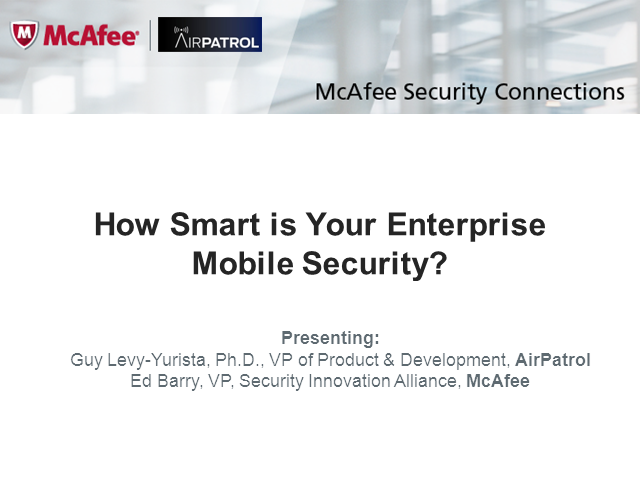 Join this webinar to learn how McAfee and AirPatrol are working together to help protect your mobile assets and enhance employee productivity. Title: How Smart is Your Enterprise Mobile Security?